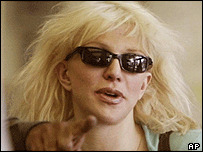 A police officer said Ms Love gave him "a plastic bag with pills"
Singer Courtney Love must stand trial on two drug possession charges, a Beverly Hills judge ruled on Thursday. The charges relate to an incident last October in which police found painkillers at her Beverly Hills home. Ms Love, 39, is also due to find out on Friday when she will stand trial on separate charges of disorderly conduct and being under the influence of drugs. 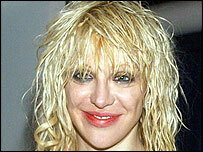 The ex-Hole star also faces assault charges in New York stemming from an altercation in a nightclub last month. On Thursday, Superior Court Judge Elden Fox found there was "reasonable and probable" cause to bind her over for trial after hearing testimony from a police officer called to her home. The officer, Douglas Trerise, testified that he was called to Ms Love's bedroom, where she "gave [him] a plastic bag with pills from the foot of the bed". An analysis showed that the pills were the prescription painkillers oxycodone and hydrocodone, Mr Trerise said. Ms Love was taken to a hospital after police discovered the drugs. Her lawyer, Michael Rosenstein, said outside court: "We do believe that we'll provide prescriptions" to show that Love was allowed to possess the drugs. She went to court in a black strapless dress and carried a book entitled The 48 Laws of Power by Robert Greene. She later appeared on The Tonight Show to promote her album, America's Sweetheart. She acknowledged to host Jay Leno that she was a "smartass" when the police came to her house. Ms Love recently lost custody of her daughter Frances Bean, 11 - daughter of her late husband Kurt Cobain - and told the US magazine Blender on Wednesday that she was broke.